The federal grand jury being used by Special Counsel Robert Mueller in his probe into Russian collusion in the US 2016 election has had its term extended by up to six months. The initial 18-month term was due to expire this weekend. The jury's members have heard dozens of witnesses and have approved a swathe of indictments so far. President Donald Trump has called the investigation a witch hunt and his aides have demanded a speedy end. There had been speculation the investigation could be winding up. As the judge issuing the extension has not given an exact time for it, that could still be the case. But it could also mean more indictments are on the way. In the US, grand juries are composed of members of the public who hear evidence in secret. Prosecutors use them to gather evidence, as they can compel people to testify or hand over documentation. They consider whether evidence is strong enough to issue indictments for a criminal trial. The juries do not decide the innocence or guilt of a potential defendant. The grand jury being used by Mr Mueller began hearing evidence in July 2017. What's the inquiry all about? 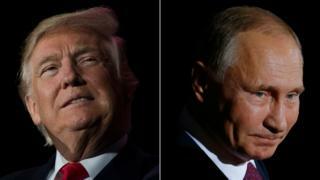 President Trump's campaign and transition teams have been accused of colluding with Russian agents to influence the US election in the then Republican candidate's favour. Both the Russian and US presidents have poured scorn on suggestions of collusion, with Mr Trump calling it "the greatest political witch hunt in history". What has this grand jury done so far? The members have listened to dozens of witnesses and have approved several indictments. They include Mr Trump's former campaign chairman, Paul Manafort, and deputy Rick Gates. Both have pleaded guilty to a number of charges. Also indicted are more than 20 Russian individuals and companies accused of trying to sway US voters. Not all of the indictments and guilty pleas are directly related to Russian collusion allegations. The jury has worked in utmost secrecy and there is no indication who may still be indicted, including whether the president himself could be targeted. A number of Trump allies, including lawyer Rudy Giuliani, have regularly called for the investigation to end quickly. One thing that could affect it is the ongoing partial government shutdown. The federal court system has the funding at present but could run out soon.